The name of this upcoming chip has not been confirmed yet, but most of the details should become official on February 28. This chip will make Xiaomi the second Chinese smartphone maker to manufacture central processing units for mobile devices. When designing its products, Xiaomi usually uses processors made by others, mainly MediaTek and Qualcomm. Now, as this Chinese brand continues its growth, the next step is to follow Huawei and to introduce its own chips. The first Xiaomi SoC, codenamed Pinecone, surfaced for the first time in multiple rumors earlier this month. Although the Mobile World Congress trade show that opens its gates at the end of this month offers a great opportunity for product launches and announcements, Xiaomi has decided to unveil its first processor in China. 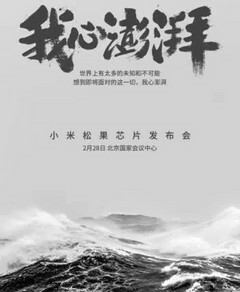 The special press event is scheduled for February 28, in Beijing. The rumors mention two Pinecone chips, one with four Cortex-A73 cores and four Cortex-A53 ones, and the other with eight Cortex-A53 cores. Sadly, nothing is official yet and even the rumors and leaks we encountered so far failed to reveal more. These being said, remains to see what we find out next week directly from Xiaomi, so stay tuned.